It’s not easy being the husband of a sewer or quilter. It really isn’t! Generally, we try hard to keep our distance, and just try and concentrate on our own business. That’s where our selective hearing gene comes in handy. And thank God we have such a wonderful tool at our immediate disposal. Like most of you husbands, my sewer/quilter wife loves talking to herself, especially while she’s working in her sewing room. And that’s okay. A bit weird, but it’s fine and apparently quite “normal” with this hobby. But, some of the things “they” talk about are just downright ridiculous to me. Here are just a few examples of them saying the darndest things. I’ve never been formally introduced to my wife’s sewing “companion”, but I’m just assuming that her name is Dam. It’s seems logical to me given that it is the most frequently spoken word I hear coming from her room. Anyway, one day my ears perked up when my wife was complaining to Dam about having two feed dogs that were giving her fits. I’m not sure what the problem was, because I’m the one who feeds our three dogs, not her. It made me wonder if I had forgotten to feed them and perhaps I was starting to get dementia – just like my mother. Not to admit wrongdoing, I snuck upstairs and quietly fed the dogs “again”. 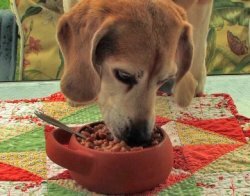 They ate like I hadn’t fed them in days; but being beagles, it’s often hard to tell given their ferocious appetites. It’s obvious that my wife has fun sewing with her friend Dam. When she isn’t fussing about her cuts, she’s giggling about her princess lines (which I assume refers to wrinkles) or someone blind hemming. I find myself snickering about these hilarious statements. Good thing the blind hemmer can’t see her princess lines or her crooked stitches! I never realized that a long armed quilter can do a better job than a short armed one. My wife is not tall and has pretty short arms, but claims to be an excellent quilter. Go figure! Sewers and quilters are super tough too! I overheard a telephone conversation my wife was having with a friend. She apparently just got in a car wreck and was stuck in a ditch. She must not have been too banged up though, because my wife was explaining to her how to stitch in the ditch. Now that’s one tough, dedicated woman! Sometimes my wife and Dam talk about cooking. That’s great for me, as it’s often during meal time when I’m getting hungry. However, I soon lose my appetite after hearing the details of their cooking conversation. She says that “A quilt is often basted in the sandwich stage”. Nope! That’s not at all appetizing to a non-quilter. I’ll pass! I know how difficult it is being on a diet. It’s not easy. It takes a great deal of will power and a very positive and creative approach to succeed. But creative was an understatement for what I heard coming out of the sewing room. Yes, this was over-the-moon and in another galaxy creative. My wife and Dam were talking about fat quarters. I tried to picture one chubby leg and one sleek one, or one flabby arm with saggy breast and one taunt arm with perky breast. It just didn’t work! I thought about entering the room and explaining that fat halves would be more accurate, but I realized it was safer for me to just implement selective hearing again. On a similar note, my ears perked up the other day when the word “strip” came up during a telephone conversation I overheard from the sewing room. I listened intently and heard them talking about strip piecing. It sounded like a fun game, and one that most guys would enjoy observing. Well, until I came to my senses and realized that the average age of quilters is 62 years old! Once again, I’ll pass on this one. Well, I better get my walking foot up the stairs before my wife gets wind of all the personal things I’ve been telling you. I sure don’t want her and Dam to stack and whack me. That sounds painful! We want to thank those of you who stopped in to help us celebrate Love Your Sewing Machine Day last Saturday. We sold a whopping 10 used sewing machines! Based on its popularity, we will offer this event a couple more times during the year so you can pick up a great used machine. 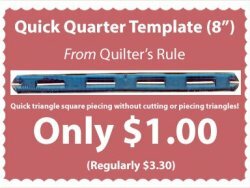 For our Weekly Steal of a Deal, get 8" Quick Quarter Templates from Quilter's Rule for only $1.00. Quick triangle square piecing without cutting or piecing triangles! The sale goes through Saturday and are also available from our website. Next Thursday (25th) we are celebrating National Chili Day. Stop in between 11:00 am and 1:00 pm for a cup of FREE homemade chili. It even has Jack the Bitterroot Beagle's stamp of approval. Monday, February 29th is Leap Day! Nothing leaps better than a frog, especially a green one. So, all of our Frog Fabric will be 25% OFF and any Green Fabric (must be at least half green) will be 20% OFF.